Students practice for their upcoming performance of “Mary Poppins” as part of Curtain Call Performing Arts Center’s ongoing summer camp. In musical theater, a “triple threat” performer has the ability to act, sing and dance. 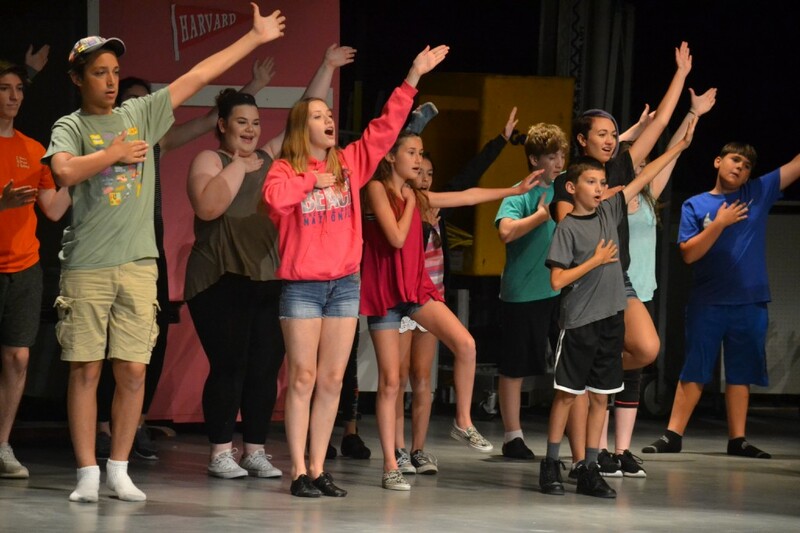 Yet for the students and staff at Curtain Call Performing Arts Center, the term triple threat could also be used to describe CCPAC’s ongoing summer camp, as its casts and crew are getting ready for three shows at once. 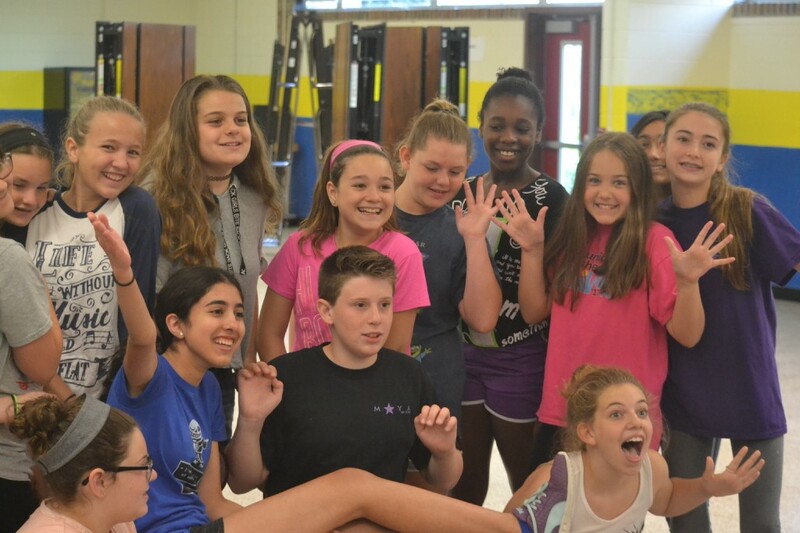 Whether it’s CCPAC’s elementary-level kids preparing for “The Jungle Book Kids,” the middle school kids preparing for “Bye Bye Birdie” or middle and high school kids getting ready for “Mary Poppins,” the performers and crew have been hard at work in the theater and classrooms at Harrington Middle School this summer. “It’s a lot to juggle,” said Anne Kessler, founder of Curtain Call. Through their days at the summer camp, Kessler said the kids rotate between practicing dance, choreography, music and show rehearsal, as well participating in acting games and working as part of the crew part-time. In addition, Kessler said even though the kids are in mostly different shows, they all still get together for team-building exercises to help them feel as if they’re part of the same family. 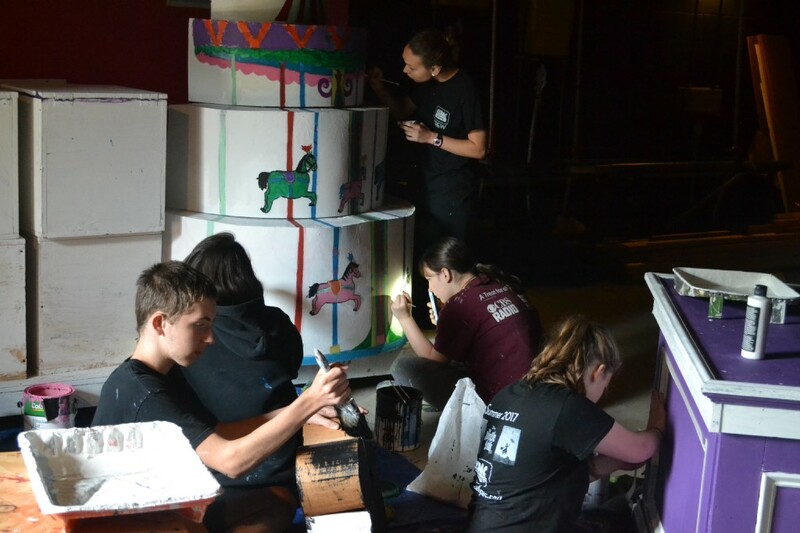 Members of the summer camp’s crew team work hard at crafting sets and props for the upcoming shows. Curtain Call tech director Tama-Rose Bazzle echoed Kessler’s sentiments, noting all students will help build sets and other necessities throughout the week by joining her core crew team of six or seven students and two assistants. Bazzle said work in the crew helps students take skills they’ve learned in a classroom and apply them to their theater work, whether those skills are art, design, math, precision or even just how to focus. Also trying to draw out some of the kids’ natural talents is “Bye Bye Birdie” director Danielle Gallo. Gallo, who will soon head into her junior year for musical theater at American University, said she’s in a unique position to teach the kids versions of the lessons she’s learning professionally and have the kids apply them to a kids’ show while balancing the fun of theater. Students practice for their upcoming performance of “Bye Bye Birdie” as part of Curtain Call Performing Arts Center’s ongoing summer camp. For 12-year-old Sam Pelaez, set to play the titular role of Conrad Birdie in “Bye Bye Birdie,” his time at CCPAC has given him the freedom to “let go” and have fun playing different characters while learning to improve his theatrical talents. Those interested in attending one, some or all of CCPAC’s upcoming shows can visit www.showtix4u.com for tickets and prices. All shows will run at Harrington Middle School. “The Jungle Book Kids” will run on Aug. 3 at 10 a.m., on Aug. 4 at 1 p.m. and 7 p.m. and on Aug. 5 at 2 p.m.
“Bye Bye Birdie” will run on Aug. 3 at 1 p.m. and 7 p.m., on Aug. 4 at 10 a.m. and on Aug. 5 at 7 p.m.
“Mary Poppins” will run on Aug. 10 and Aug. 11 at 11 a.m. and 7 p.m. and again on Aug. 12 at 1 p.m. and 7 p.m.